It’s a commonly accepted fact that what we spend in monthly rent here in New York City could buy an entire house -- a nice one, at that -- pretty much anywhere else in the country (except maybe San Francisco). But rent still goes much further in some neighborhoods than in others -- or, at the very least, will secure you a very different type of apartment. In Long Island City, for example, luxury high-rises are easier to come by than prewar brownstones or industrial lofts. And in other corners of New York City, modern comforts (elevators, dishwashers, and high-tech security systems) are readily exchanged for square footage. To see just how far your monthly paycheck can go, we looked at apartments currently on the market for $2,250 a month across a dozen neighborhoods -- from still-coveted SoHo to lesser-known communities in the Bronx and the up-and-coming (or up-and-came) neighborhoods of Brooklyn. While that may sound steep, that price will keep you out of 200sqft bedbug-infested studios with a bathtub in the kitchen, while still saving you more than $800 off the average NYC rent, leaving you enough money for your monthly subway pass, utilities, and other basic living costs. Best known for its arty and grungy history (and today, for its proximity to bars and restaurants), the LES is mostly a mix of old, retrofitted, and gutted walk-ups. Spending $2,250 on rent will get you a studio or even a small one bedroom. 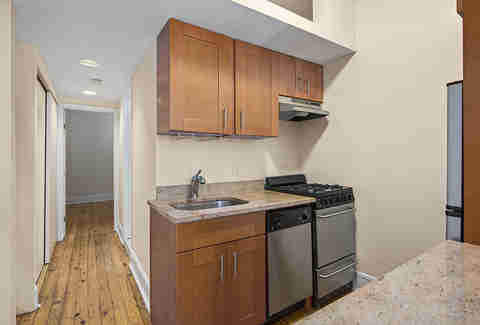 Kitchens are tiny at best (don’t be surprised if it looks like your oven was cleaved in half) but may have forgiving open formats or updated appliances, like this one on Ludlow St. The real estate market has responded to New Yorkers’ increased interest in Harlem, transforming old townhomes into attractive rental properties with on-site laundry facilities and granite or quartz countertops. Renters in this neighborhood should stick with a one-bedroom space for added amenities like dishwashers (gasp!) and private balconies. 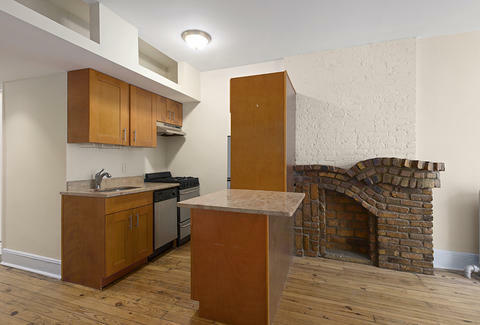 This apartment on West 132nd St has all of the above, as well as built-in air conditioners. You’ll never have to call for help to remove those window ACs ever again! With its industrial aesthetic and impressive waterfront views, this section of northern Brooklyn has quickly become the answer to overcrowded Williamsburg. But while it might still feel like a new frontier, space here is already quite limited. A monthly budget of $2,250 for rent can score you a one bedroom or a studio, like this one on Havemeyer St. And what you lose in a bedroom wall, you gain with a generous, private balcony and in-building laundry room. While the neighborhood’s famous light-filled (and affordable) artists lofts are increasingly rare, it is actually possible to find one- and two-bedroom apartments in parts of Williamsburg for $2,250 per month. Still, in a bare-bones one bedroom, like this one on South 3rd St, the most you can really expect to find inside are those noisy steam radiators and creative cabinet configurations -- and not much else. If you want to live close to the office, you can easily make that happen with $2,250 per month in Midtown East (especially if all you need is a studio). On Lexington Ave, a 500sqft studio doesn’t have much in the way of walls or views of the city, but it does boast exposed brick details and a modern kitchenette. And you can probably admire the skyline from your desk at work, anyway. Head to Bay Ridge if you want two-bedroom (and even two-bathroom) apartments with truly impressive closets. 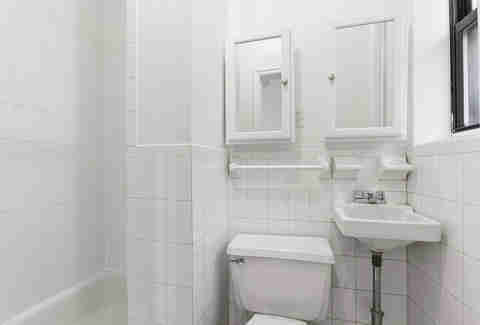 A gut-renovated pad isn’t guaranteed, though floor space is. Renters can even find elevator buildings with live-in supers, like this nearly 1,200sqft apartment. Best of all, Bay Ridge has managed to stay relatively hipster-free, despite having all the usual trappings of coffee shops with Nutella-infused beverages and vegetarian restaurants. Word has most certainly gotten out that Astoria is the hottest neighborhood in Queens. As a result, $2,250 a month can easily land you in an outdated two-bedroom apartment with a kitchen featuring those too-familiar, white particle board cabinets. Look instead for a brand-new or just-renovated one bedroom, like this 32nd St space with stainless steel appliances and thoughtful finishes like recessed lighting, exposed brick walls, and a gleaming white bathroom. Believe it or not, an annual allowance of $27,000 for rent can actually get you a space in SoHo. It will be a small studio or one bedroom with a kitchenette, but it will be in SoHo, and it may even have a full-size refrigerator. Find the best deals by searching for properties available immediately. At 179 Prince St, for instance, there’s an attractive one bedroom done in light wood and white accents (like a subway tile backsplash) that feels bright and inviting. Despite the neighborhood’s newfound popularity, great deals can still be scored in this historic section of Brooklyn. Two- and even three-bedroom spaces, with high-end finishes (marble, hardwood, and stainless steel) are easily found -- especially as you drift away from Franklin Ave. This two bedroom on Maple St is a particularly modern example, with upscale hardware in the bathroom, a private deck, and a net effective $2,250 per month rent after a one-month free deal. Ever wonder what it’s like to live at the end of a subway line? Trying to spend less than $2,000 per month in this part of the Bronx, just south of Mount Vernon, is pretty easy -- for less than that, you can easily score an entire floor in a multi-family house. At 4048 Harper Ave (a three-bedroom, one-bathroom space) there’s a quirky mix of mahogany hardwood and carpet, making it feel like more of a home than a standard New York apartment. Rental units here may not be updated as frequently, but you’ll discover more square footage off the Dyre Ave stop than in all of the West Village. Don’t be dissuaded by the neighborhood’s stroller-clogged sidewalks. Park Slope has plenty to offer renters of every age group, with its attractive, tree-lined streets, access to green spaces, and excellent restaurants and wine bars. A cozy one bedroom in Park Slope will cost $2,250 per month, and renters have a high likelihood of finding prewar details such as crown molding, exposed brick, and even a decorative fireplace or mantle. 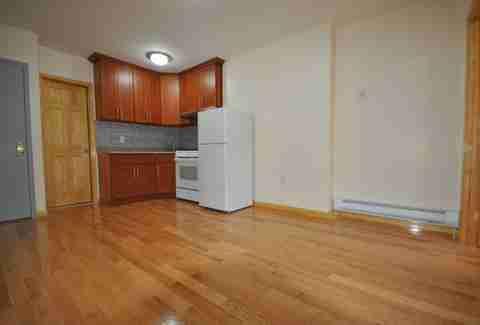 At this 437 First St listing, you’ll even find a dishwasher and bay windows. Luxury high-rises are growing increasingly popular in this Queens neighborhood -- according to Naked Apartments, at least 91% of the market are newly constructed properties. 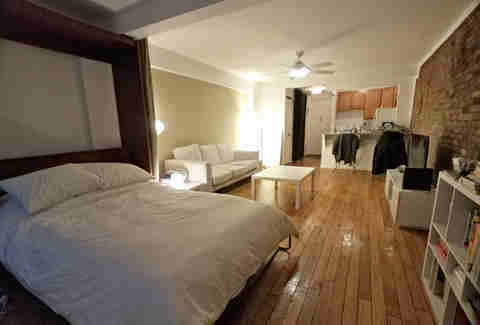 Expect to find a spacious, modern studio with hotel-like shared amenities for $2,250. At this specific listing on the 32nd floor towering over Center Blvd, residents can enjoy a roof deck furnished with lounge chairs, a fitness studio, and -- we kid you not -- a volleyball court. Similar properties even offer cold storage rooms for all those Blue Apron deliveries. Melanie Taryn Lieberman is a New York-based writer who thinks square footage is really just a state of mind. Or one of those so-called alternative facts.